Here is a look at the 23 players advancing to Day 2 in the money from Flight B of the $600 No-Limit Hold'em Multi Flight Re-Entry event. These 23 will join the 16 players from Flight A, and any that bag in Flight C tomorrow, and will return to play Day 2 at 11:00 am on Monday April 30th. Facing a raise from Andew Dubuque in the small blind, Soukha Kachittavong moves all in from the big blind for around 60,000, and Dubuque quickly calls. 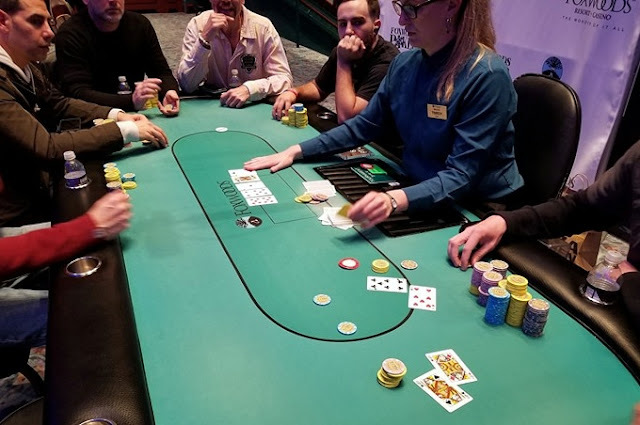 A player in late position says, "I folded Ace Seven," just as the flop comes A♥10♦7♦, giving Dubuque a set of sevens to take the lead. Unfortunately for Kachittavong, the K♠ turn and 2♣ river do not improve his hand, and he is eliminated from play less than five players from the money. There were a total of 244 entries in today's $250 No-Limit Hold'em Super Stack Turbo event, generating a prizepool of $50,886. The top 27 places will make the money, with first place taking home $12,161. Play has just begun for Event #3, the first $250 No-Limit Hold'em Super Stack Turbo event of the series. This event has always been one of the most popular since it's introduction here at Foxwoods, and today is no exception. There are already 126 entries registered, and a line 20+ people deep still waiting to register. Registration is open until the start of Level 11, and re-entries are allowed until reg closes, around 7:00 pm. There were a total of 184 entries in the second flight of the $600 No-Limit Hold'em Re-Entry Event #1. The field will play down to the final 23 players before bagging and tagging later tonight. Those 23 players will join the 16 players that advanced in yesterday's Flight A, along with any that advance in Flight C tomorrow, and will play Day 2 on Monday April 30th at 11:00 am. All players that make Day 2 will return in the money, and any player that bags in multiple flights will take home $1,200 for each additional stack they bag, with only their largest stack advancing to Day 2. For the list of players that bagged in Flight A, please see this link. All Day 1s will play down to approximately 12% of the field. All players that make it to Day 2 will return in the money. This is a best stack forward tournament. If you bag chips more than once, you will receive a payout of $1,200 and play your best stack forward to Day 2. Day 2 Levels will be 40 minutes each.